The wines I receive come from the The California Wine Club Premier series. The series features two wines each month: a white and a red. 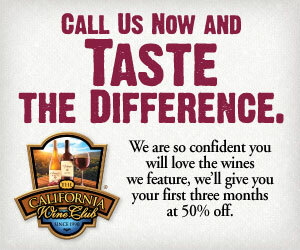 The Premier Club is an inexpensive option for the wines you try. Over the upcoming months I will be rating two California wines that I have received. So far I like the choices because these wines are not just from Napa or Sonoma, but also places like Monterey, Santa Cruz, Santa Barbara and even the Sierra Foothills. Monday was a quiet day and Chris was considering what to prepare for our dinner. I had been wanting to try the bottle of 2012 Claiborne & Churchill Edelzwicker that I received from the California Wine club. I had a feeling this wine was going to be sweet after reading the label. Chris and I contemplated what to pair with the wine. She rattled off ideas and ingredients that we had on hand and I suggested that we have a salad with blue cheese as its sharpness should work great with this wine. 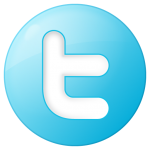 I wondered whats behind the name Edelzwicker. After a little research the interesting word “Edelzwicker” is a term used in the French (once German) province of Alsace to refer to an unpretentious everyday wine blended from various white wine grapes. Strictly speaking, these should be the four “noble” (Edel) grapes of Alsace: Riesling, Gewürztraminer, Pinot Gris and Muscat. However, in practice other grape varieties are often accommodated. 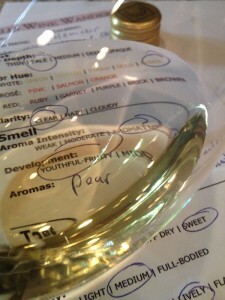 The Edelzwicker wine was pale and the hue was amber. There was no sediment in the glass or bottle. After I poured each of us a glass, we noticed that this wine was very aromatic and fruity. I could smell pear and apple with fruity citrus notes. As I suspected. The Edelzwicker was sweet and light bodied. It’s finish was soft and silky and was slightly acidic. The finish was medium in length. Wine makers notes: Blended from selected lots of dry Riesling, Gewürztraminer, and Pinot Gris. abv: I could not fined it on the label. Interesting because I thought you had to label the alcohol content. I guess I need to research that. 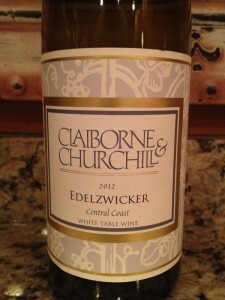 I rated the 2012 Claiborne & Churchill Edelzwicker three glasses. The Edelzwicker paired very well with the blue cheese salad.